Our upcoming exhibition, Educate Agitate Organize!, looks at several different facets of the creation of agitprop. One thing we’re excited to explore is the way that the same symbols are reused across time and place by various movements, as acts of solidarity, as a way to create identity, and to communicate similar or disparate messages. We want you to help us explore this! Join us on June 5 for an agitprop scavenger hunt. We’ll give you a short list of symbols to hunt for, and we’ll provide an orientation on how to find material in the archive. Then it’ll be your turn to explore and see what you can find! 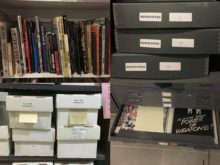 This event is a great way to get to know the archive more: no experience working with archival collections is necessary, and we hope you’ll come dive in with us! Questions? Feel free to send us an email.